Bump. 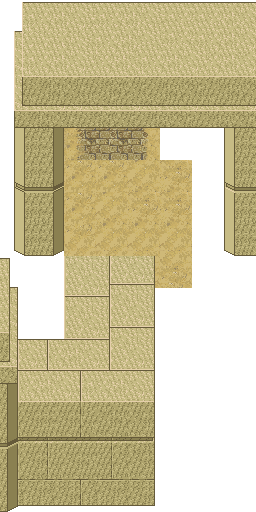 I was looking for desert/Egyptian tiles and art (Even though I don't want to make it "Egyptian"). I came across this old post. I have a plan for a quest and it involves a big set of maps. Been saving art from this post and other TMW/Evol sources. Only makes sense to work with others if they are still interested. Many new functions are possible with Hercules too, making this quest/map even more interesting on Evol. I'll have to figure things out as I go, but want to have parts of it made in an arcade style, like gauntlet, but more dynamic. I have ideas for traps and am trying to use as much already made art as possible, since I am not a pixel artist, per say. I want the pyramid to be massive since each level will be smaller than the last as you progress upward and each level. Each level is like a stage to complete. Each level should be different than the last, meaning there is something new to figure out the first time and best if something in the puzzle can change at random each time. I would like to make it near impossible to complete and the reason is to give players a different atmosphere for levelling and a ridiculous challenge that they can attempt over and over. Easter eggs and silly fun too, but parts with jump scares, etc. It's all talk now, but the work has begun here. attempting to get familiar with tiled and see if there is a way to build this monstrosity and make it as dynamic as possible. I will look into the actual angle of the great pyramid and others. Once I know that, I can simply cut off the wall tiles at the proper (or close to it) angle and make transparent. If it is built from the top down, then it is just a matter of making tiles from already made tiles for diff levels until the pattern matches back up again. You should start at the top of the pyramid, and then progress downwards. This would mean that every level would become bigger and therefore more difficult, if it was the other way around it would become easier the further you progress . As for the art itself, I would like to suggest to make the pyramid more Aztec like. This makes it easier to make tiles for it at the right perspective and it has some stairs that lead to the top, so that you can begin there (and see the massive scale while you are still outside!). I might have some tiles for it, however I am unable to find them at my work, so I probably have those only at my home pc... As far as I remember I never posted those as there are only a few tiles, and the quality isn't great... There is a lot better art out there, which you probably already have. I will see if I can find these later. This is a great thread to revive. All of this content would fit very nicely in any area of Tonori outside of Tulimshar. It's a big desert and Tulimshar has a very middle-eastern feel so it would make perfect sense to connect it to a southern area with an Egyptian theme. I knew some of these things but others I'd never noticed before. There's so much forgotten treasure in this section! These huge blocks are cool! Lets see if we can make something out of that.. .. Thanks EJlol for posting the extra art. I love the big blocks too. I know stepping stones easier, but even if I had to resort to making 45 degree angles to use as edges, I would. While writing this, I checked and it is 51.4 degrees. That is so close to 45 that we can use 45. Very simple. I also don't want to worry about the structure too much, since a real pyramid wouldn't stand with all this empty space. We'll just call that part magic, I guess. What I was thinking is, closer to the top the last n levels would all be one map, though they may not overlap each other. A stepped up platform could indicate a level rise. It could even be closed off till it is figured out how to open it. Although mobs should be obstacles, I'd like to move into the trap realm more. A chars strength and other attributes could play a role more detailed than just battle physics. I'd like to make every attribute valuable at some point. I also plan on having characters attack stationary things, like to sever a metal chain for instance. I realize part of the chain would need to be a stationary mob or even cooler if you can hide as a player char, but I doubt that possible. The only for sure, there should be (I hope) is a secret entrance that would take a player directly to the basement but it would have to be earned, possibly each time, and there would be extra obstacles to make up for gaining entry. The 1st level entries would all make a player need to go to the basement to get to the 2nd+ level or other mind benders to confuse. Another thing to consider... the lower levels are as much a maze as anything else and there are different ways to get up to the next level (meaning more smaller rooms, most the player won't see this run). What I want to do is have a semi-random exit available OR have it based on switches players walk over (if possible). This would prevent someone from mastering a single way to the top, since a different visit would mean needing to take a new route. They could only master to the point of knowing the 'possibles', since there is no for sure route..